MUMBAI: The high-profile auction of the Indian Premier League (IPL) media rights has a classic Catch-22 connotation to it that the cricket industry hasn’t yet woken up to in entirety. 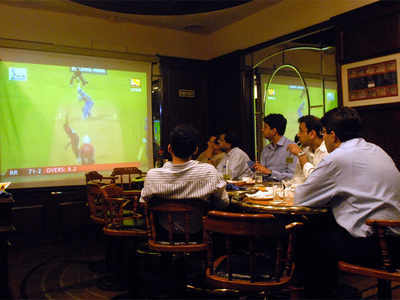 The auction, one that – among other bidders – puts the onus on a highly anticipated clash between Star India and Sony Pictures Network(SPN), hinges around some unique set of clauses that the BCCI has dished out in the Invitation To Tender (ITT). Any bidder can either submit a consolidated global bid, or a breakdown bid of sum in parts, or both. The last of the three options has huge potential to make this auction head into an unfamiliar tizzy next month. A breakdown of the privileges has the following rights on offer: Sub-continent TV rights, India digital rights and rest of world media rights, all until 2022. A bidder can either put a global consolidated bid and pocket all three, or break down the bid and buy rights that cater to a specific market, or submit separate – global and breakdown – bids to stay relevant either way. In effect, while it eventually boils down to the numbers that bidder manages to put, segregation of bids allow BCCI to look into revenue maximization. Therefore both – consolidated and breakdown bids – have serious potential. Star, given the vast Indian and global base at its disposal – from television and digital perspective – is expected to put a global bid and the reasons are clear. A global bid allows star to monetize across territories. That aside, the overall digital growth is tremendous and will allow a global player like Star – with a platform like Hotstarand a massive market in the west to either consolidate revenue streams or do year-on-year deals. Contrarily, a breakdown bid has a completely different perspective because an accepted view is also that ‘Media is leveraged and exploited in local markets and not globally, which essentially means, if you have a business, then bid for that market’. There are those who are certain that BCCI has been ‘unintelligent’ in asking for a consolidated bid. Nevertheless, here’s where the Catch-22 begins to ring in as far as Star and Sony are concerned. For the sake of simplifying matters, here’s an analogy. Assume there’s a full grown tree on sale and has a lot on offer for prospective buyers. There are several bidders interested in buying different parts of that tree. Some want the trunk, others the roots, many the fruits and leaves. Among all these bidders, only Star desperately needs the entire tree. Almost all others, including Sony Pictures, want the sum of parts of that tree. In this, if the trunk of the tree alone makes for the Indian sub-continent TV rights, Sony will make every desperate attempt possible to buy that trunk with the highest possible bid, even if it will mean buying the entire tree and they’re capable of breaking the bank for it. It is for this reason – to counter Star’s global bid – that Sony Pictures may submit two separate bids for the rights, consolidated and breakdown, simply leaving nothing to chance. Given Star’s global reign in cricket – ICC and Indian cricket rights included – losing IPL rights will still keep them in business. However, if Sony let go of India sub-continent rights – one they’ve held for a decade now – it will lend a massive blow to their sports network cluster, one that first began with their entry through the IPL in 2008. The current IPL rights holders have little interest in digital and Rest of the World but it’s the India market they’re desperately fighting for.